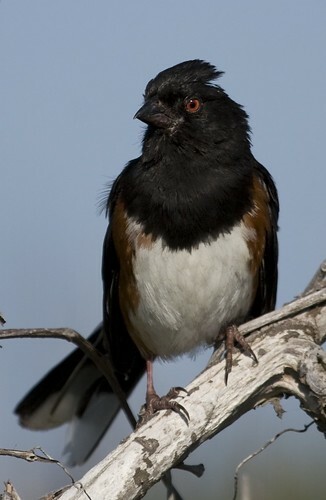 I spent May 23-28, 2007 in North Carolina on a Don Wilkinson Birding Tour. Four of us (me, Don, Nancy Eaton, and Lynn Abbey) participated. 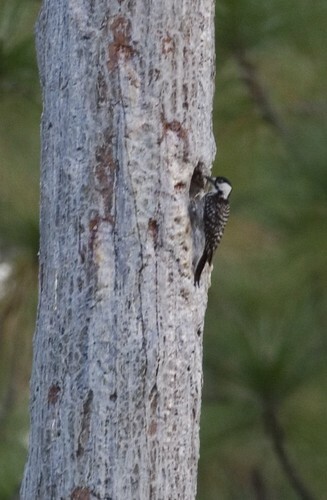 We all flew in to Norfolk, Virginia on the 23rd and immediately drove to New Bern, North Carlina, where we went to the Croatan National Forest for Red-cockaded Woodpeckers. 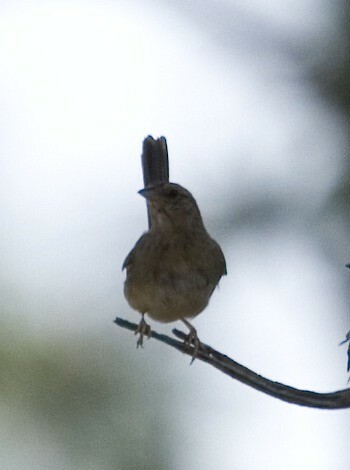 We spent the night there, found Bachman’s Sparrow back at the Croatan the next day and then headed to Manteo with a stop at the VOA site to try for Henslow’s Sparrow. We spent the next morning at Alligator River NWR, looking for Swainson’s Warbler and then spent the afternoon on the shore at Bodie Light and Pea Island NWR. 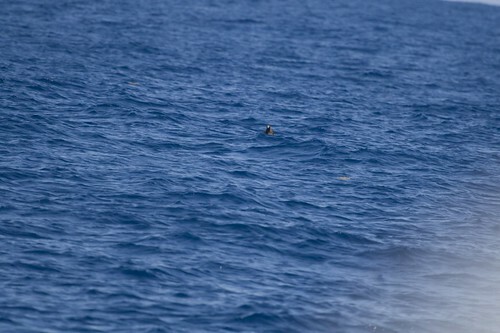 We then had two lackluster days offshore. The last day was spent getting Swainson’s Warbler and then working our way back to Norfolk. Overall, we had 135 species (I had 129+) and everyone got at least one life bird. Detailed daily notes are on the individual pages, a trip list is below. Today we started by trying for Swainson’s Warbler and then birded the coast a bit. We were at McDonald’s at 6, although they didn’t get around to opening the door for another couple minutes and had no one to work the counter. Eventually the help arrived, although without her reading glasses. Don loaned her his pair and we were able to get breakfast. She handed them back and proceeded to make other customers wait, even as Don offered them back. We went to several spots at Alligator River NWRfor the warbler (Milltail Road and others), all without any sign. Overall it was pretty quiet, with lots of Prothonotaries and what I think were Mantled Baskettails (dragonflies) and not much else. We eventually hit on the idea of calling the refuge headquarters and asking about access and for any recent sightings. They weren’t able to help with any sightings, but did call us back to say that the “Superspot” that had been closed for the last few years was now open. We quickly worked our way over, but still had no sign of Swainson’s. 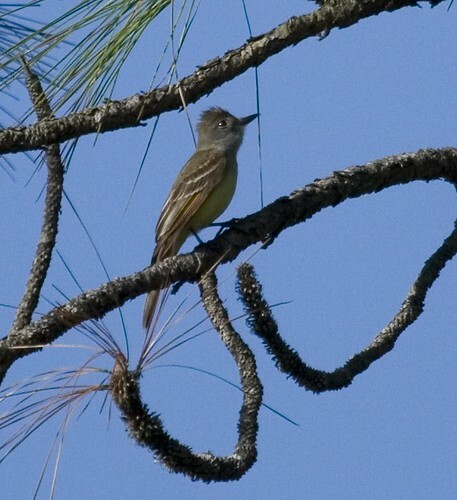 Acadian Flycatcher was nice and there were Pileated Woodpeckers everywhere, but otherwise it wasn’t too exciting. It was close to noon now, so we started to head towards the coast and find lunch. 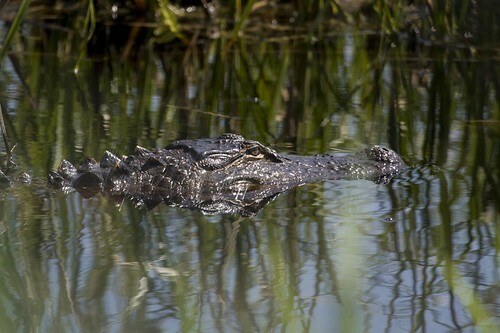 On the way out, we had one of the big surprises of the trip with an Alligator in the marsh. We ignored the no stopping signs and watched and photographed for a few minutes. We headed towards the coast and found lunch at Sam & Omie’s in Nags Head. It was fairly empty when we walked in, but was full shortly after. One of the specials was fried Spot. The waitress described it as a whitefish, so Don and I tried it. Nancy had steamers and Lynn had crab. They failed to tell us that preparation consisted almost entirely of cutting the head off and throwing it in the fryer. Don called for help and the owner came over and explained how to eat it: work from the back and the fins and tail were like potato chips. I found it to be pretty good once I learned how to avoid the bones, Don seemed to be a bit turned off. Lynn and Nancy both found their food very good. After lunch, we headed down the Outer Banks. 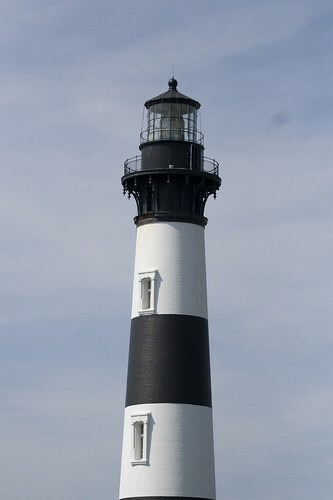 Our first stop was at Bodie Light, where we had the big surprise of the trip. There was one person on the platform as we walked up. He immediately turned to us and said “I’ve been staring at this bird for an hour and I’m almost convinced that it’s a Curlew Sandpiper.” We all jumped and got on the bird in question. It was rather distant and we only had 2 scopes between us, but we all got acceptable views. 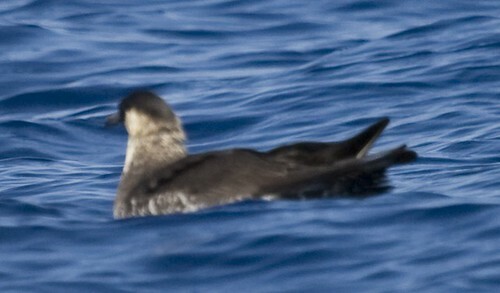 The bird still appeared to be in basic plumage. It was limping slightly, which proved useful in refinding it. We watched for probably close to an hour, during which it lifted its wings a couple times and flew twice. Somehow, we all lost it as it flew. After the first time it flew, I found a limping bird fairly quickly but the second time it disappeared. 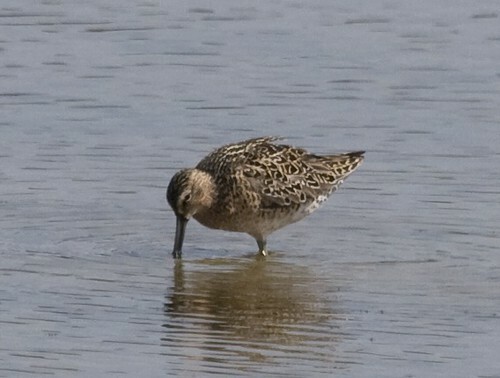 Overall similar to the Dunlin, but a bit slimmer, longer, and with a longer bill. Of course we had no references, but Nancy thumbed through The Shorebird Guide in the gift shop and found a similar picture. At home, I dug through several books and will say it looks like the first-winter bird on page 115 of the Facts on File guide. 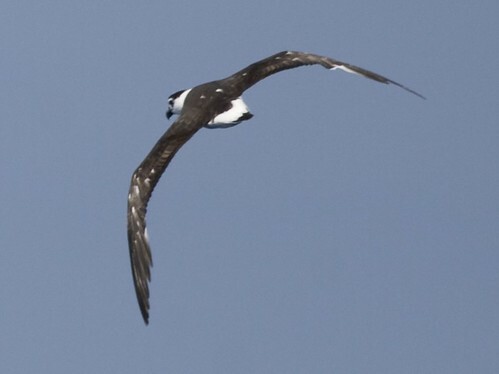 Even though we lost the bird in flight, we were all but convinced that the rump was pure white. 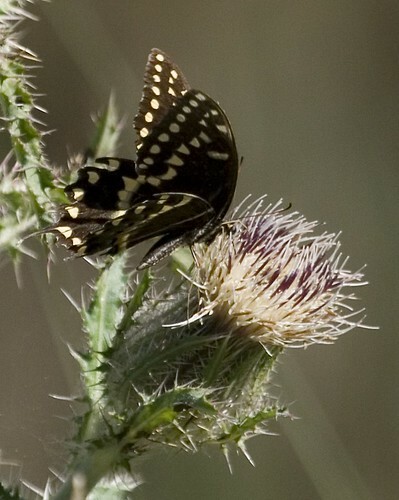 There was no sign of any other color when it lifted its wings, although the angle wasn’t straight on. I did attempt a few pictures, but they were way too distant to be any good. There were plenty of other good birds around including many Dunlin, a Whimbrel, several Glossy Ibis, flyover Royal Terns and many herons and egrets. Eventually, we moved on. The guy who found the bird was waiting for some friends he had called in, although we would later find that they didn’t relocate the bird. We moved on to the boat ramp and heard several Clapper Rails but were unable to see them. The next stop was Pea Island NWR. The heat was pretty bad at this point, but we walked out most of the boardwalk anyway. I found a Spotted Sandpiper while people were in the gift shop. Out on the boardwalk, we had many Seaside Sparrows, a good number of sandpipers, many more herons, egrets, ibis, and some coots. There were a few terns around and we had good looks at a perched Gull-billed and Forster’s. Also all along the edge were many Rambur’s Forktails (damselflies). We took a drive through downtown Manteo before dinner and then ended up at the Country Kitchen just down the road from the hotel. It looked like a dump, but the food was very good and extremely cheap. A few locals started talking to us and had lots of things to say about the area. After dinner, we took a quick ride to the Black Rail spot, which was now posted No Trespassing. A short distance down the road was a parking lot, so we took a quick walk out and found we could get out into the marsh in theory, but it was a long, buggy walk. We returned to the hotel and ran into Ken. Luckily for him, he had a nice close, breeding plumaged Curlew Sandpiper up in Cape May and some decent seabirds on his first trip. Today would be another try for the Swainson’s and then a trek back to Norfolk and flights home. We were out again early. This time McDonald’s was open and close to prepared. We headed for Alligator River, making a brief stop at the Bear Road spot we had tried the other day without anything. 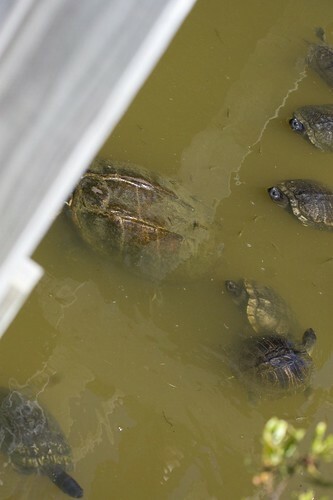 We went to the Superspot. As we passed the marsh, there were some odd calls but nothing we really made note of. Further on, I spotted a Barred Owl perched on the side of the road. We all got excellent views. For some reason, I didn’t feel like dealing with the camera right then and am now kicking myself. We soon reached the spot where we had been the other day. We parked and began to walk up the road. Pretty quickly we thought we heard something and were soon fairly sure that it was a singing Swainson’s. Finding a decent viewpoint, we stopped and Don played the tape. The bird came right in! We watched it as it moved from a pile of branches onto the ground and stayed more or less in sight for about a minute. I went for the camera pretty quickly, but had forgotten to check the settings, so I was still set on the more distant focus (which changed the close focus point to well over 20 feet). I got some nice blurry habitat photos but no bird (I expected at least a blurry bird in there, but haven’t been able to find it). With that great success and plenty of time, we decided to stop and look for Yellow-throated Warbler on the way out and then head back to Bodie Light and see if there was anything different around. As we passed the marsh, Don pulled the most difficult sighting I’ve ever seen by someone driving when he spotted a King Rail! We were able to stop and back up and all got very good looks at it for a few seconds before it finally disappeared. On the main road, we stopped at the pines where the warblers were likely. With a good bit of effort we heard one repeatedly and eventually got some distant views. Not great, but everyone did see a bird this time. We continued on to the coast, stopping briefly for gas for the first time of the trip. 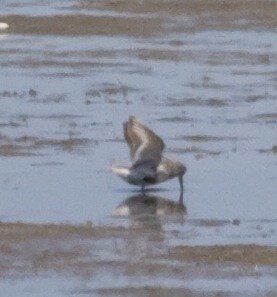 At Bodie Light, we had a similar assortment of sandpipers and herons. They were closer in and we were able to get good looks at Short-billed Dowitcher, Dunlin, Semipalmated Plover, and Least Sandpiper. 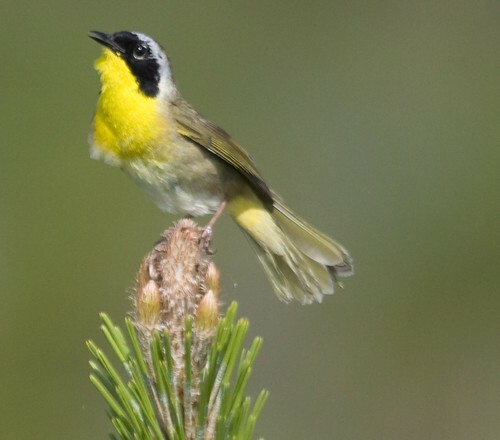 A Common Yellowthroat posed extremely nicely at the top of a small tree. I attempted a couple lighthouse shots, but didn’t have a small enough lens to get more than half at once. 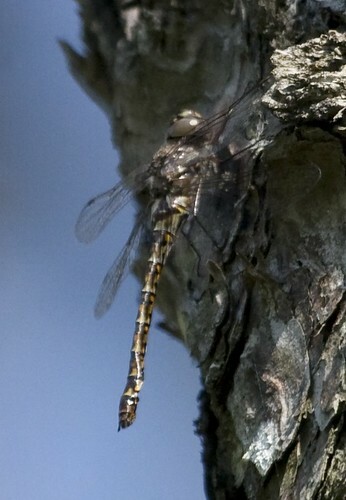 There were also numerous Seaside Dragonlets flying around. 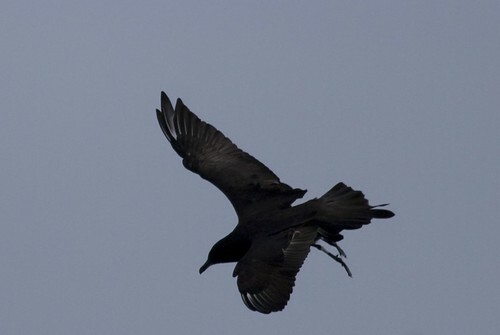 While waiting for people at a bathroom/giftshop break at the car, a Fish Crow made an appearance. And then it was off north. We took a more coastal route for a while, which was loaded with traffic and nothing much. Eventually we stopped for lunch at some tourist-trap looking restaurant just before the Virginia border. The food was pretty good. On our way out, we started talking to some people outside selling jewelry. They told us about the sparrow nests right there and also gave us a tip for cheaper gas back in Norfolk. We made it back to the airport fairly easily (we got lost at the same spot we did on the way down). The rental car return was out in the middle of a parking lot, it didn’t look like fun for the staff and was a fairly long walk to the terminal. Inside, we said our goodbyes and headed to the gates. The flight left right on time and went smoothly. 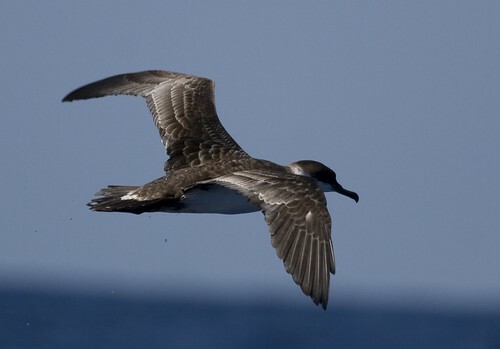 I was able to see a few terns as we made our approach, but couldn’t identify any for sure. There was a little delay getting off the plane (another down the stairs, walk outside, back up) but that meant we didn’t have as long to wait for bags. My parents were waiting at the baggage claim and offered to take Don to his car at Wonderland. That turned out to be a worthwhile detour, as on our way back to the Pike an American Kestrel flew by, which was one of the big misses of the trip. Back home before dinner, glad I had the next day off. Day 2 on the boat made Day 1 look good. 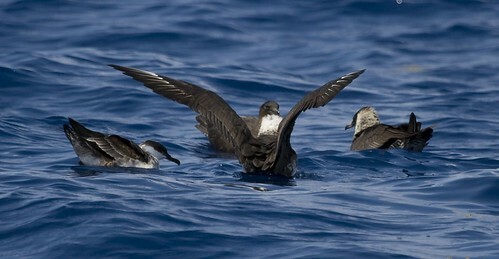 We started out the same, missing the terns again. 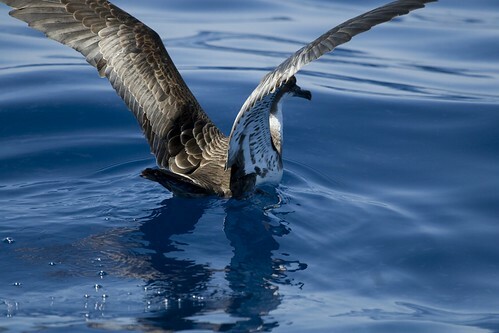 Once out into the ocean, we had a few jaegers and started seeing shearwaters and storm-petrels. 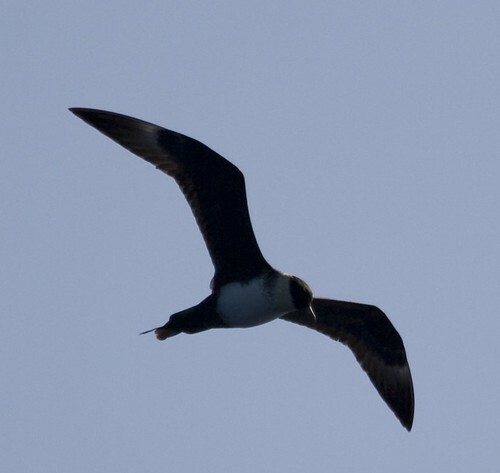 A bit of excitement came as 3 Pomarine Jaegers buzzed by several times. 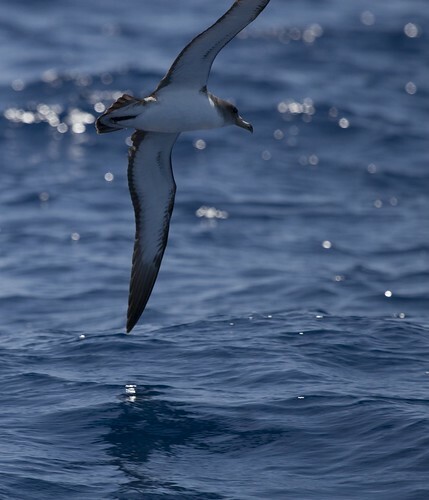 There were more Cory’s Shearwaters around (one was called a Scopoli’s by Todd McGrath although I couldn’t say anything other than it looked slightly different). 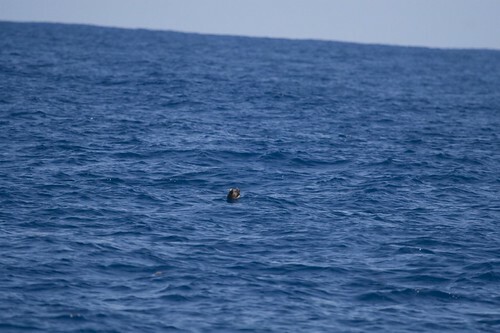 A Manx buzzed through, but I didn’t see anything more than just a dark blob moving. 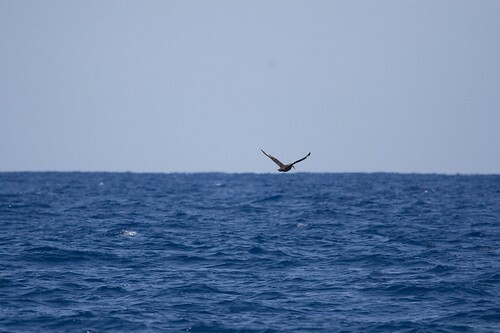 At one point, a Bridled Tern made a distant appearance. This was a bird Nancy really wanted and I started to find her. 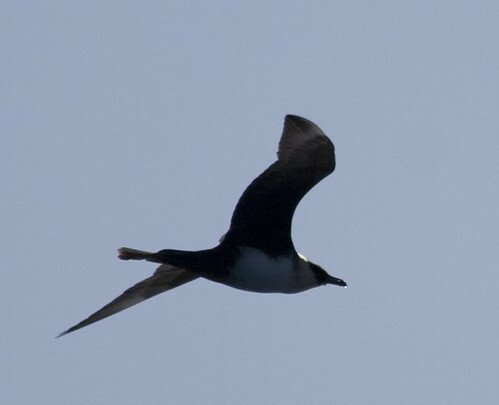 Someone else shouted “No, Long-tailed Jaeger.” That didn’t make any sense to me and I stopped to take another look. Of course, the bird kept going and Nancy didn’t get on it. I’d say I saw it enough to count, but not great for a life bird. Somewhere along the way we found a large sack of drugs floating on the water and had to sit around waiting for the Coast Guard to pick it up. Interesting, but not enough birds to be thrilled. The fishing was dull as well, with only one caught today. 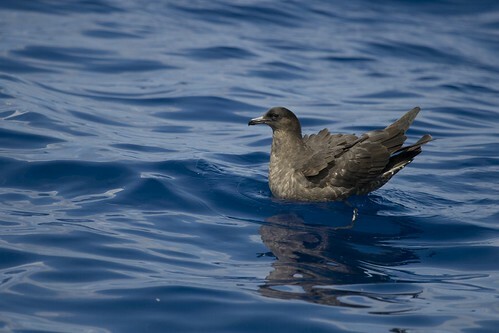 We did have a few Black-capped Petrels, one of which was cooperative. 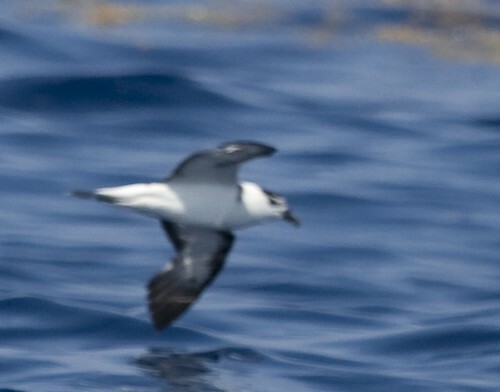 Again, we had a leader only Band-rumped Storm-Petrel. The jaegers made another appearance and came almost within touching distance before sitting on the water for a few minutes. The leaders gave up pretty early today and most of the time was very birdless. We ended up getting back in so early that the captain was able to pull off to the side just before going under the bridge and let us watch the terns for several minutes. I finally got a decent look at the Sandwich (thanks Christine for thinking to ask) and took some nice photos of a Royal as well (good enough to see that it was banded). No one even offered a tally for today. Just to show how Pileateds were everywhere this trip, I saw one flying down a side street as we returned to the hotel. After a quick stop, we went out looking for a nicer dinner. Ken and someone else from the boat joined us (I should have noted names, Julie I think). All were fairly disgusted by the leaders and it doesn’t sound like anyone wants to go out of Manteo again. We ended up at The Full Moon Cafe, which turned out to be very nice. I had shrimp and grits, which was quite good and different. Everyone else’s food looked as good. The service was incredibly nice, splitting our checks even though they have a no splitting for parties of more than 5 policy. We went back to the hotel, said good-bye to Ken and Julie and started packing to get ready to leave tomorrow. Today was the first of two days offshore. An early start again, stopping at the 7-11 with the rest of the hotel and grabbing some food quickly. At the dock, we couldn’t really hear the instructions but not a big deal. Since I didn’t keep track as carefully of what order things were in, I’ll just list some of the highlights and add pictures at the end (mostly). 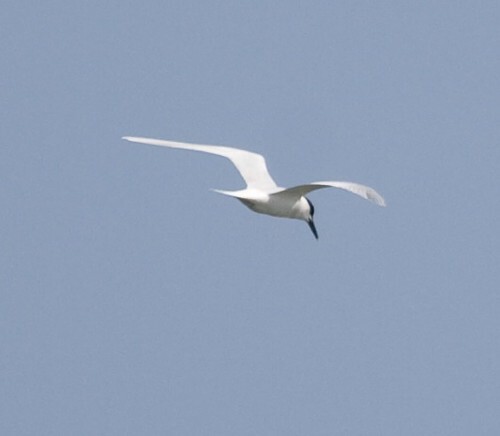 We started with terns in the harbor. I missed the good ones (Sandwich and Caspian). 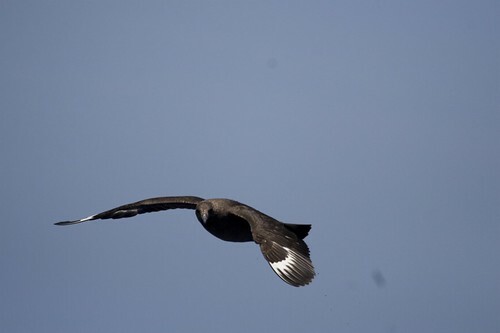 Out of the harbor, we had a few loons and gannets and not much else for quite some time. 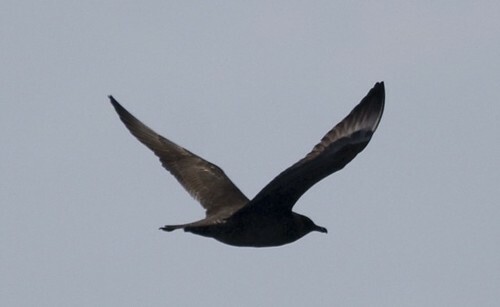 A couple miles out we had an odd surprise with a Chimney Swift buzzing by. 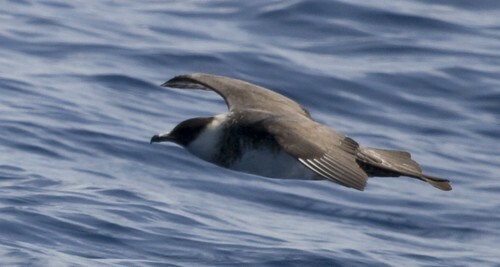 Eventually we started seeing a few shearwaters (Sooty and Greater) and many Storm-Petrels. 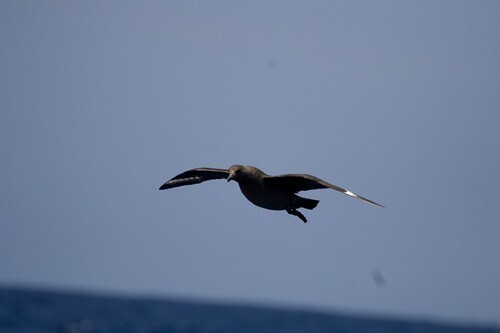 We had a few jaegers eventually (Pomarine, of which I spotted the first, and Long-tailed). 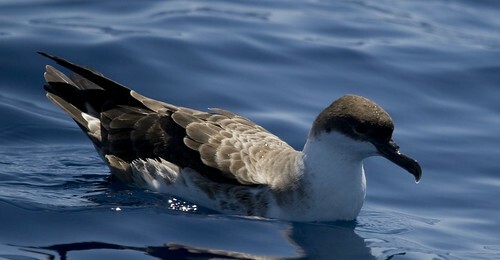 More shearwaters were around, including a few Cory’s and Audubon’s. 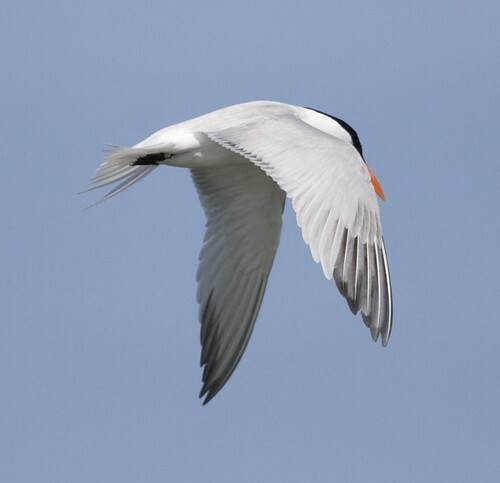 We also had a nice side-by-side comparison of Arctic and Common Terns right at the boat (brilliantly I took no pictures). 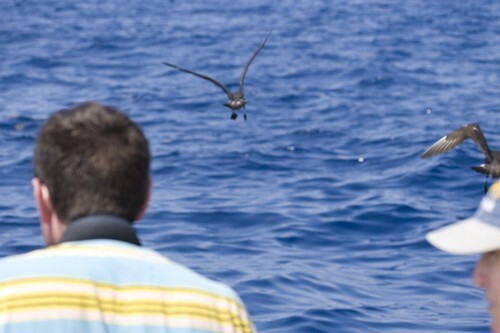 There was a little excitement when a Black-capped Petrel passed through. It didn’t stay and many people missed it. I happened to see it as it came over the horizon and was on it, but I don’t think anyone that only looked once the call went out actually got on it. Rather surprising, it was the only one of the day. The morning fishing was fairly good. 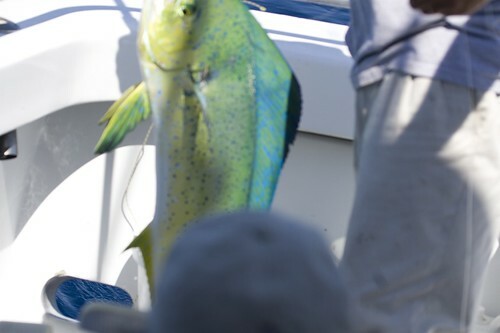 We reeled in 5 or 6 Dolphinfish (Mahi-mahi) and hooked something else that got away. At one point, we had 3 on hooks at once. Things cooled off for a while. 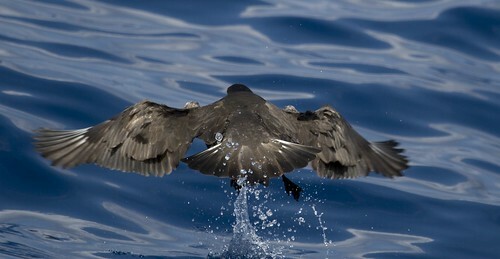 There was a brief rush over a Band-rumped Storm-Petrel that ended up being leader-only. 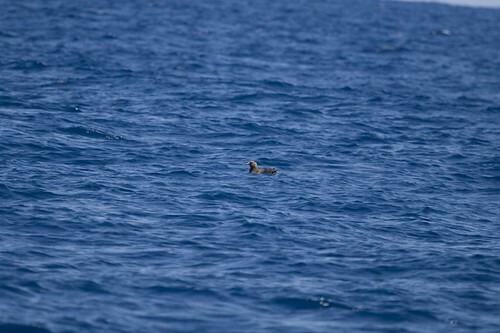 A few Cory’s Shearwaters joined us for some time and some Audubon’s passed through. 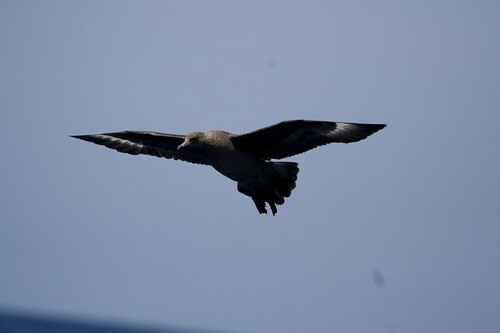 After a snack break, we finally had a decent bit of excitement when a South Polar Skua came in, landed on the water and grabbed some of the chum and then left. I did get a shot with the head out, but there was a head in the way, so not quite. After that, things stayed very dull. The leaders decided to move to the color change. 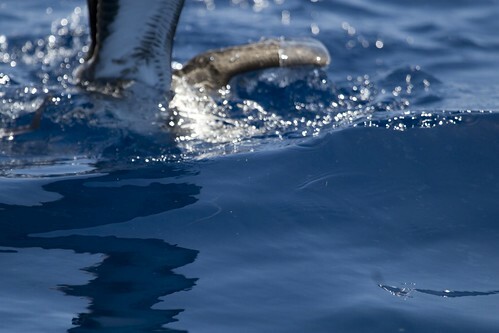 Before getting there, we found a few Cobia, an expensive fish that the captain stopped to catch and missed. 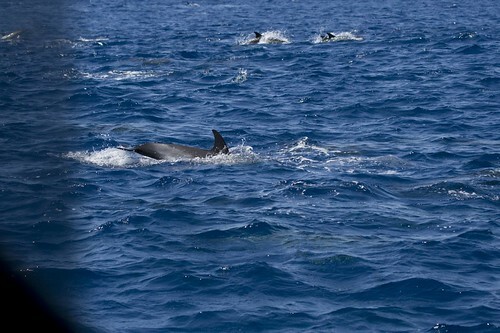 A little further we saw a few Spotted Dolphins. 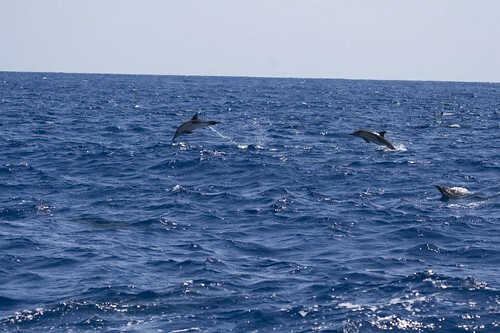 Shortly after, we found an absolutely enormous pod of Common Dolphins. Mike Tove (who wrote the book on North Atlantic marine life) estimated the numbers in the thousands and said it was by far the largest number he’s ever seen. 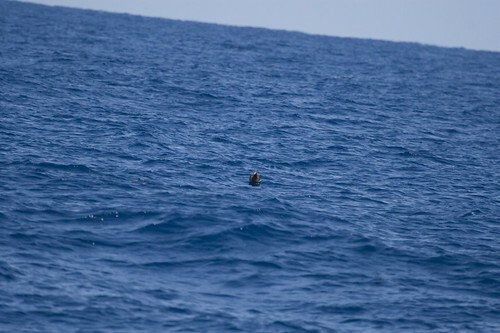 We also had a Loggerhead Turtle here. 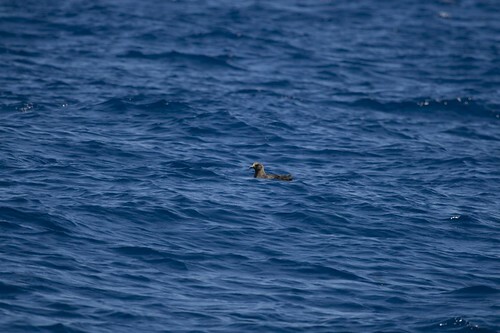 We still didn’t find much in birds, although a Red-necked Phalarope was nice (especially since I thought the flying fish earlier were phalaropes and couldn’t figure out how they kept disappearing into the waves). 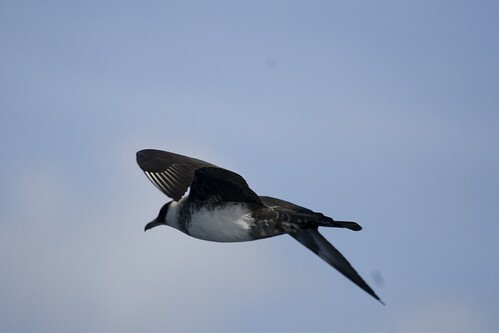 Back into the harbor, the same terns were around, which I again missed. I did see some Oystercatchers and a Ruddy Turnstone, both new to the trip. In not much of a surprise, no one stayed around to hear the day’s totals. We wandered around for a little while looking for dinner and finally just went back to the country kitchen. Again, cheap and decent. The White Ibis right on the side of the road was quite different from roadside birds at home. Today was an early start as we wanted to be back at the Croatan and get the singing Bachman’s Sparrows. We slowed briefly on the way in to listen to a Yellow-breasted Chat and a mystery noise that was likely a Red-shouldered Hawk, although being next to a farm we weren’t sure it wasn’t something more exotic (another farm up the road had guinea fowl running around). We went straight to the place we had the sparrows last night and had no luck whatsoever (one quick distant song was it). We did have more Brown-headed Nuthatches, including one that came close to posing, a gnatcatcher at a nest, and a perched Turkey Vulture. Eventually, we moved back to where we had the woodpeckers last night as it was in the general direction of that single song. The woodpeckers made a brief appearance and we had a Red-headed or two as well. Prairie Warblers were everywhere as well. After poking around for a good bit of time, Don decided to try another spot mentioned in the book, which was up and around the road. Just as we turned I spotted a Wood Duck high in a tree and another Red-headed Woodpecker came through. Down the new road, we had brief looks at a couple Bobwhite right at the side of the road. We soon reached the spot and started to walk a bit. It was slightly more open here and Don decided to try the tape quickly. Almost immediately a single bird flew up onto a short branch at eye level maybe 50 feet in and sat there. The shape was incredibly distinct, looking like nothing else (I don’t remember the Botteri’s I saw in Arizona being this different). We all got excellent scope views. I snapped a couple pictures, but the lighting was awful so they are just short of being silhouettes. With that success, we went to try the spot here for Swainson’s Warbler. Although it supposedly required wellies, the edges were dry enough that I was able to go around without testing my boot covers. No sign of any Swainson’s, but we had nice views of a Hooded Warbler (overhead!) and Yellow-billed Cuckoo. I made a pit stop on the way out and had a second Hooded buzz by. We heard a few Prothonotaries as well, but didn’t spend any time working on. Eventually we gave up and started for Manteo, looking for lunch on the way. We found some sort of southern country buffet that wasn’t particularly good. It was all that was available when we wanted food, so it was fine anyway. We continued on and made a stop at Alligator River NWR (Buffalo City Rd) on the way. We alternated between driving a short distance and walking. At the first stop, we heard a Kentucky Warbler (glad I had the one at Mt. Auburn the Sunday before to keep it fresh). I found another new dragonfly, a Great Blue Skimmer. 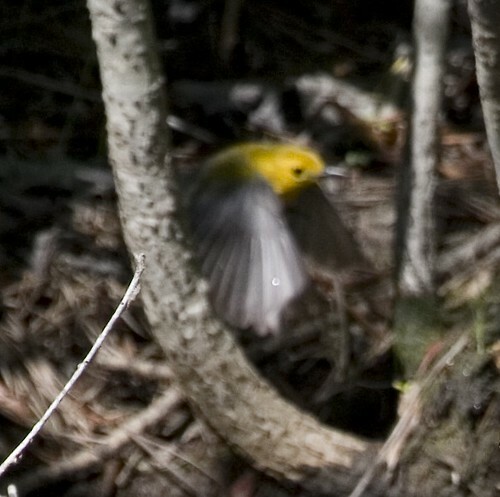 Further down, we got a nice Prothonotary Warbler, right out in the open. Great looks at this bird finally. And after that first one, they were getting in the way. At the far end of the road, we walked the side trail a bit. A Yellow-throated Warbler was singing. I got a brief, but good look at it as it crossed the trail and then kept going, but everyone else missed it. We finally reached Manteo, and quickly checked in at the Duke of Dare. It apparently was dumpier than last time (and wasn’t all that great to begin with), but since we were basically just crashing it didn’t matter too much. For dinner, we went to Big Al’s (owned by the captain of the Country Girl). The food was ok, although portions were small and it was noisy. We decided that it wasn’t worth trying for Black Rail and that was it for the day. Day 1 (May 23) started with a 6 AM trip to the airport. A Downy Woodpecker in the yard, a Red-tail on 128, and gulls and cormorants on the Pike got things going. After being dropped off, I waited for the outside check-in, although the line was probably a lot longer than the one inside was inside. Still didn’t take much time to get through there and through security. Waiting for the plane, I went back and forth between the TV and people watching. One guy stuck out as looking somewhat like a birder, but I remembered Don as having a thick mustache. 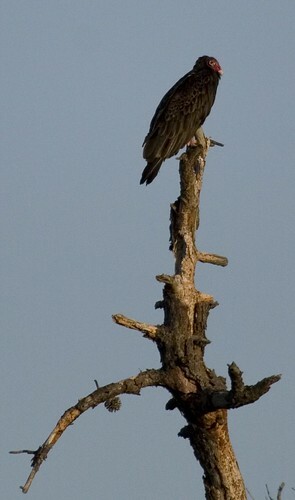 Apparently he had shaved, as he eventually came over and picked me as the other birder pretty easily. We chatted for a few minutes about equipment and what we wanted to see. The call to board came fairly soon and we started for the plane. Between getting out tickets checked and reaching the plane (which was outside), someone called out to Don. It turned out to be Ken, whom he had met on an Attu cruise. Ken was from California, but had flown in to Boston to try for Sharp-tailed Sparrows, Purple Sandpiper (successful), and Bicknell’s Thrush. 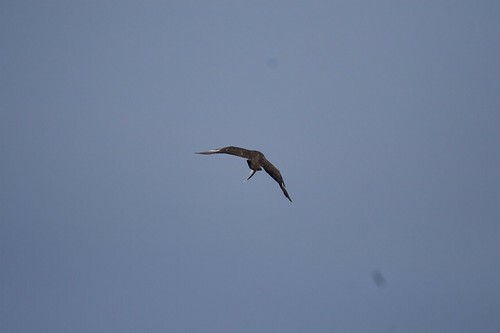 He was flying down to Norfolk, running up to Cape May for Curlew Sandpiper, and then taking 10(!) days of boat trips, so we would see him again later. The flight was very easy. Once it was obvious that the plane was barely half-full, I got a row to myself. No luck finding oystercatchers as we took off. We landed early and quickly made our way down to the baggage claim. In record time, we not only had our bags, but Lynn and Nancy both arrived. I think we had everyone together and ready to go to the car rental within 15 minutes of getting off the plane. The car rental took a few minutes, but soon we were on the road. 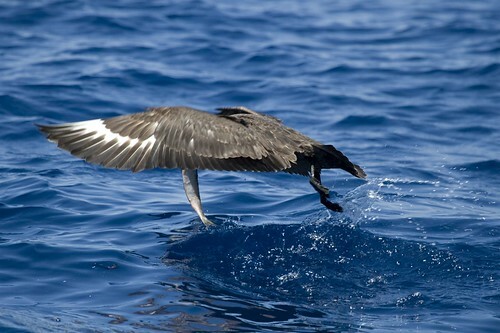 We made a quick stop at the local Subway, grabbed a few bottles of water, picked up our first Laughing Gull, and were off. We made it into North Carolina with only one wrong turn (which we would make on the way back as well). 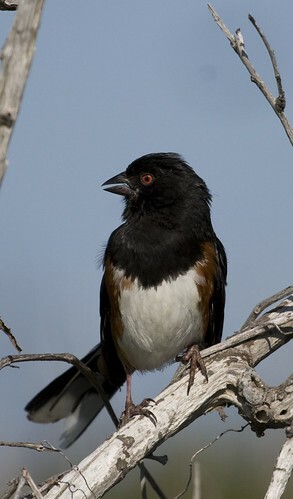 We took a short rest stop at the Roanoke/Cashie River Center, where we immediately had a first year male Orchard Oriole, which turned out to be the only oriole of the trip. We soon continued on and somewhere along the way I got a Black Vulture that no one else was able to get on at 70 MPH. Eventually, we reached the VOA site to scout for Henslow’s Sparrow. Don and I both thought we heard one once or twice but couldn’t be sure. We definitely heard Summer Tanager and saw a few Eastern Meadowlarks. The site itself is quite interesting, a giant open field with a bunch of radio towers (short-wave apparently) half a mile or more out in the middle. I also picked up a life dragonfly here with a distant Carolina Saddlebags (Tramea lacerata) and there were a few butterflies as well. After a few minutes here, we moved on and eventually reached our hotel in New Bern, where we had a few minutes to relax. But not too long as we headed out to bird the Croatan National Forest (pronounced Cro-a-tan as we eventually found out, although Croe-tin and Cow-tan were in the running) and had a quick meal at Wendy’s. There were a few farms on the road into the Croatan. 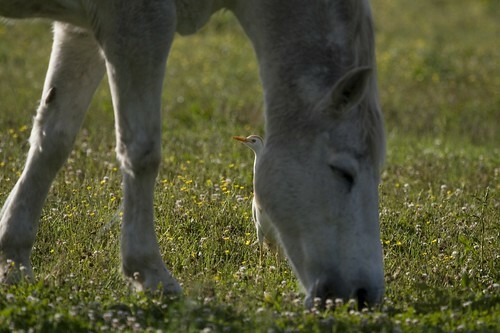 Hiding among the horses at one was a number of Cattle Egrets. 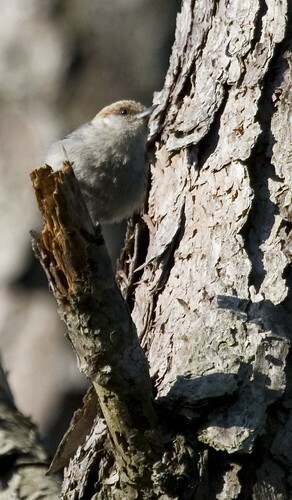 We arrived at the Croatan and began looking for Red-cockaded Woodpecker. The first spot didn’t have any, even with a good bit of trying, although a Common Nighthawk circling and landing and a flyby Pileated were both very good. We moved on to a second location and fairly quickly heard something that sounded like it could be one. After bushwhacking a good distance, I spotted a single bird way off. Fortunately it flew in much closer and sat around long enough for everyone to get excellent views with the scope. A second bird soon flew in and also gave good looks. Both birds eventually went into their own holes and didn’t come back out, so they must have gone in for the night. Happy with that success, we continued down the road a bit, mostly to get further down so we’d have more room to hopefully have a Chuck-will’s-widow on the ground. Several had started calling, and at our next stop several Bachman’s Sparrows were singing as well, although it was too dark to see them. Unfortunately on the drive out, a car zoomed past us, which pretty much eliminated any chance of there being any nightjars on the road. Total for the day was about 47 species. I also had 17 species of Odes (new ones included Rambur’s Forktail, Mantled Baskettail, Great Blue and Bar-winged Skimmers, and Carolina Saddlebags) and 10 butterflies (Palamedes Swallowtail was new). Other stuff included American Alligator, Loggerhead Sea Turtle, Spotted Dolphins, Common Dolphins, Offshore Bottle-nosed Dolphins, Flying Fish, Cobia Fish, Dolphin Fish (Mahi-Mahi), and Hammerhead Shark (I missed the shark).